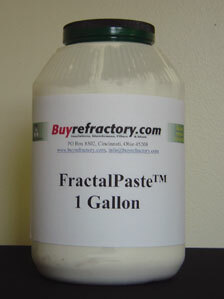 The Fractalpaste is a totally fiber free product. It provides emergency repair or complete restoration of damaged furnaces at a fraction of the cost compared to the total relining of a furnace. Most often this paste is used to fill cracks and after drying in place may be fired to the furnace temperature. Application Process: Fill the Fractalpaste into any cracks. Use Fractalballs if required. The repair area needs to be dried and readied prior to re-starting and using of the furnace.